Ripe bartlett pears from my garden ready to bake after I drizzle fresh honey over them. The first batch of freshly picked Bartlett pears have safely arrived at their destination and have been rated “yumm” by one of my brothers. It has become an annual family tradition when I have fresh Bartlett pears to share. After seasoning them to start ripening, I carefully wrap each one in newspaper and bubble wrap and ship them off, timing them to arrive with at least a couple of them ripe enough to eat right out of the box. I know my brothers, they aren’t going to wait to have them cooked. These are not just any Bartlett pears. These are pears not from a farm but from the semi-dwarf pear tree I planted by my driveway in 1983. I completely forgot I even had the tree until 2010, when the first crop of pears covered my driveway. Wasps had pollinated the tree that spring. That was also the year I added two bee hives to my garden, which looking back now appears redundant. Between the bees and wasps, the Stark Brothers pear tree has provided varying crops of pears every year. In 2012, the year of a drought, it was just one but it was quite a large pear. Now I know to pinch off some of the flowers to encourage yearly fruiting. The squirrels in my garden have developed a taste for pears so it’s a race between who will get more pears by the time they are ready to pick. Squirrels, I have learned, don’t mind eating very green pears so they have a head start on the count. By the time the fruit was ready to pick this year, I used a light bulb changer and removed every single remaining fruit. They are now sitting in baskets in my cold utility room to get the ripening process started. Pears ripen from the inside, not on the tree. This year, I also added a small container of honey to the pear packages so my brothers and their families could enjoy baked pears in honey. The recipe is easy and delicious. These pears have survived daily squirrel assaults to be a treat on your table. After getting picked, they were seasoned in 60F temperature for a week to start the ripening process. Pears ripen from the inside. Once you receive yours, place a couple in the enclosed brown bag with an apple so the apple ethylene gases will complete the ripening. 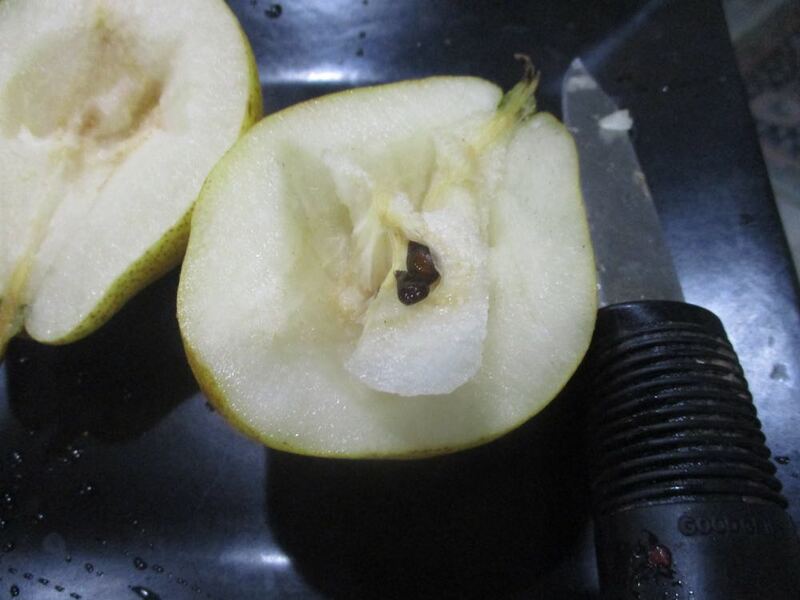 A pear is ripe when you gently press the top with a thumb and find it soft to the touch. Bartlett pears with honey baked, cooled and ready to taste. Cut the pears in half and place on a baking sheet (I cut a sliver off the other end so they sat upright). Leave the skin on. Sprinkle with cinnamon and drizzle 1/2 teaspoon honey over each one. You can also add walnuts in the scooped out center. Bake in the oven 30 minutes. Enjoy!